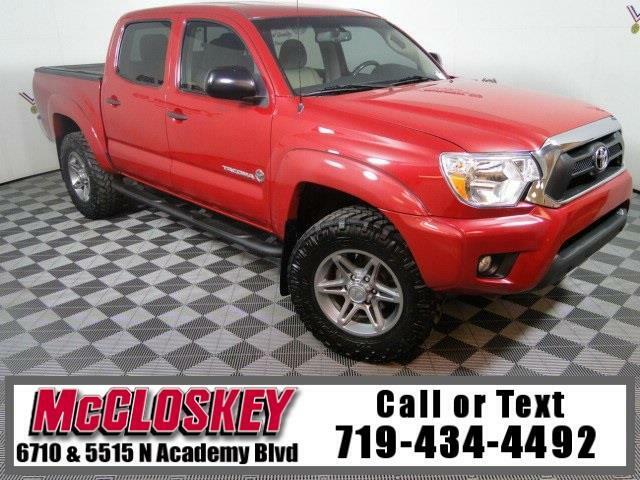 Capable and well-styled 2013 Toyota Tacoma SR5 4x4 Double Cab with Keyless Entry, Backup Camera, Premium Sound System, and Mighty 4.0L V6 Engine! The entry-level Tacoma Double Cab adds power mirrors, driver seat lumbar adjustment, a 60/40-split rear bench seat and rear seat vents. The engine powering this 236 horsepower and 266 pound-feet of torque! . Enhancing the Tacoma's utility readiness, the bedliner's composite material makes dents and dings a non-issue when hauling furniture, bikes or other materials with hard or pointed edges. Front bucket seats offer good comfort and support.